A perhaps throwaway remark by Pete Gregory (a.k.a. Dr Doom) that the Burton club should maybe refight part of the Battle of the Bulge to commemorate its seventieth year, suddenly brought back memories of my first ever wargaming. In the early 80s, armed with a bunch of 20mm Airfix and Esci tanks and figures, the Ardennes was the first figure gaming I did. So I was more inspired by this proposition than I otherwise would be and threw myself into this project. OK, so Flames of War is a little more sophisticated than the rules I developed back in the heyday of the new Romantic movement, but no less valid nonetheless. This is the first in a series of projects setting out how I went about the project. The object of the project is to get both an army and terrain ready for shows in the latter half of 2014, as part of a demonstration game. Taking my lead from both the FoW supplement “Nuts”, and also Steven Zaloga’s contribution to the Osprey Campaign series “Battle of the Bulge (2)”, and of course episodes 6 and 7 of “Band of Brothers”, I decided that for me the scenario I chose had to be part of the larger Battle for Bastogne. A lot of the fighting round Bastogne was grinding, a battle of artillery with little movement. However, one of the exceptions was the fight for the village of Bizory, which guarded the eastern approaches to Bastogne. This has quite an exciting narrative: an attack on the village by the 26th Volksgrenadier Division, supported by elements of Panzer Lehr. The village was defended by an Engineer Battalion, who managed to hold on until they were rescued by the 501st parachute Infantry Division of the 101st Airborne, supported by accurate artillery fire. This fight seems ideal for my purposes. And not for me the glamorous Panzer Divisions or the SS…no, I decided to go for the workhorses of the Wehrmacht in the Ardennes, one of the Volksgrenadier Divisions. The 26th VG Division was the one that attacked Bizory. There is no list for the 26th in “Nuts”, but there are options for both the 12th VG Division (very good) and the 277th VG (poor). Given that the quality of the 26th seemed excellent (described by Danny Parker in “Hitler’s Last Gamble” as the “best German infantry Division in the Ardennes”, I decided to model the list on the 12th. This is first and foremost an army for a demo game not a competition, hence many of the choices. So, the 26th, in its attack on Bizory, was supported by Kampfgruppe Fallois of Panzer Lehr (whose tanks were PzIVs, not Panthers. And the 26th had an embedded Panzer Jaeger Company, comprising StuGs, not Hetzers. An observer will also notice the lack of heavy artillery, aircraft and AA capabilities. Well, at 15mm scale, artillery always looks better off table. And the weather on the 19th December didn’t permit any aircraft intervening. Keen to assemble an army at a modest price, I looked to see what I had already. I still have a horde of Peter Pig Germans from the late 90s. They formed the basis of the army, but to those I added a load more new Peter Pig’s in Smocks and Greatcoats, to give a winter feel. I was also fortunate enough to already possess the StuG’s I needed. In fact all I had to get on the vehicle front were some PzIVs. 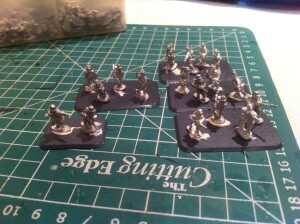 And I’ve already bought these, with the lovely panzers designed by the Plastic Soldier Company. Now all I have to do is paint the things! The 19th Burton and District competition started bright and breezy for us. With a PBI of 0, we lost the roll off, but our opponents passed the initiative. This happening in 3 out of 4 games. I’m not sure why people think that was such as good idea. Against a sluggish army like the Crusaders they largely like to be pinned back. Really this avoids the gaps in the line opening up too early. If you can deploy sensibly (with a reserve) then going second is no big issue (especially when you get the terrain advantage). In all of our games I didn’t feel like our opponents opening move was that much of an advantage. I would happily take this option ! As it happened it allowed our Crossbowmen to shine, where perhaps they might be considered mediocre. In this game terrain was largely irrelevant. A couple of bits of rough going in the flanks , back on the edges. Certainly a 4’ wide section in the centre. Our deployment was to plan. The 32 bases of spear in centre (each group of 2 8s would be supported by 1 4 of Armenian MF (great filler)) We left a 16cm gap in the centre which could be closed by the spear or occupied by Knights or Crossbowmen. The Military order were centre rear. The Armenian Knights and Crusading Knights were deployed on the right (which with hindsight was a slight mistake). The Crossbowmen were split, one in a field to the left to shore up that flank and one to rear centre. The Fatamids deployed in largely similar fashion. Their spear rear centre. Mamluks deployed in front centre. Our right flank had 2 Syrian (Superior) Lancers and 2 BG of LH. The Left flank had 2 more Syrian Lancers and 2 Arab Lancers (lesser quality ), and a bit of LF Bow. From setup it looked reasonable for us. Our spear was better (armour), although less numerous. The Cavalry on both flanks we held a slight advantage, in quality , but we were less numerous in bases and BGs. Their opening move was to send the LF and LH forward to hold us back. The Mamluks raced forward to start their shooting. We ambled forward, not committing any reserves. On the right flank the LH started peppering the KN and tempting them to charge. With 2 BG of KN vs. 2 BG of LH it wasn’t too bad , there would have to be exceptional set of circumstances to break those (more of that later!) . The Syrians on our right didn’t fancy the 2 BGs of Crusading Knights bearing down on them and did a swift handbrake turn and moved back to a safer centre rear position. On our left flank the general plan as I saw it was to envelop us with the Arab lancers while holding us in the centre with the spear and better Cavalry. Our spears pressed on and the gap closed. The Mamluks started to shoot, but because they couldn’t gang up on any target the odds weren’t in their favour. 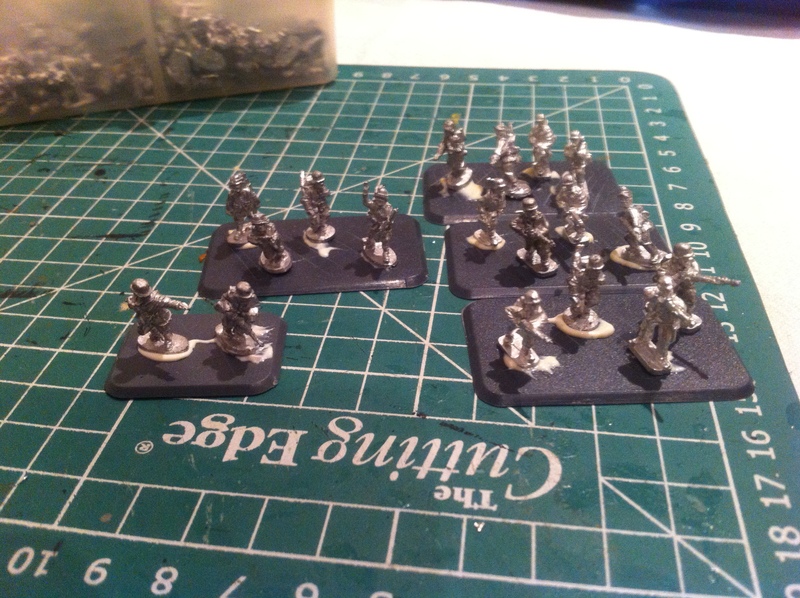 4 dice needing 5’s ,requiring 3 hits for a test and 4 for a minus… while the spear had rear support and general. Not much of sporter. As the spears closed the centre it was time to commit the Military order, to the our left. On our right there was a general swing inward. The LH were doing nothing and the chargers were swinging in towards meatier targets. The crux came as the lined closed to 4-5’ on the left one Military order was facing off 2 units of Syrian lancers. All BGs had a general in tow as no-one wanted to fail the test to charge. Being drilled it meant a 5 thought but they would have 2 tests each turn, so it was in our advantage to wait. We were trying to wiggle a spear unit to get closer and get in-between the cavalry standoff. This meant that the Berber spearmen were pushed to prevent that. Then as luck would have it Hammy failed one of the 2 tests that he needed to make. The impact was brutal. The Knights were a POA up, re-rolling 1 &2s … the Syrians needing 5 (thought re-rolling 1&2s). The Knights of Jerusalem were triumphal. They won the combat. The Syrians lost a base and disrupted – Perfect. In the ensuing melee the Syrians fragmented. In our turn we just pushed everything forward. The Mamluks were a bit squashed, with Berber spearmen directly to the rear. But it wasn’t in our interest to charge, as they were superior with a general, we weathered the shooting. But now our crossbowmen had moved up with all the enemy committed (pinned), we could then just start shooting the end of the Mamluk line with 4 crossbow shots. The Syrians to the left broke, and the rampant knights smashed into the other Syrian lancers unit behind. With their best cavalry ½ shattered and the other ½ now being outnumbered, the Fatamid saw this as a do or die moment ( they didn’t want drilled lancers floating around to the rear of their lines). SO, they charged en-masse in the centre. The fights were level and there were a lot of dice. For the spear BG that was closest the left most lancers, it was a tale of woe that Hammy will be dining out on for a while.. I should mention at this point my daughter was in charge of dice duty. In the impact were we were level, and they needed some luck (as they would be down in melee for armour). She rolled the first 6 dice , and rolled 6 5&6s (showing off as 4s would be OK). Hammys dice were poor and he only got a couple. He disrupted, it was all looking ominous. Then to compound matters with another throw she threw 11 to kill the general. A general waver when through the Fatamid lines, and several other units dropped after seeing this calamity. To the right a lancer units was trying to sneak through to get a charge in against the Crossbowmen that were shooting at the Mamluks. But they took 3 hits for their trouble and threw the ubiquitous 1 for their death roll and removed a base. The whole centre was wavering now. The left centre the second Syrian lancer was breaking… the next Berber spearmen held on briefly but soon broke. The ripple that this caused fragmented the last spear units that was behind the Mamluks, as our turn opened we charged a Spear BG as the Mamluks (who has contracted to avoid being shot , but therefore could not evade. The spear charge also targeted the fragmented Berber spear who didn’t stand. The whole Egyptian centre was now in flight. The Fatimid’s lay crushed. We have only lost 2 bases in the whole game and suffered 1 disruption. So would be a 25-0 .. a rare score and a perfect start for the Crusaders. Who prior to this had never won a game.